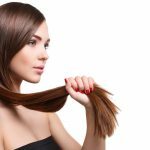 Dabur is the most popular brand producing blends of natural Indian hair oils. The most beloved product is Amla – natural oil that comes in various kinds, for example anti dandruff, cooling, etc. Another interesting proposition is Dabur Amla serum for dull and lifeless hair. Dabur is a brand that specialises in the production and distribution of cosmetics made on the basis of Indian plant extracts. Amla oil is the key ingredient that is present is almost every product from Dabur. Depending on the other components, it can boost hair growth, work anti dandruff, darken wisps or strengthen hair prone to fall out. Dabur Amla Hair Serum is a solution for damaged, dry and weakened by colour-treating strands. It can ba used on hair and scalp, although, the second method you must use it with caution if your scalp is sensitive. This product contains not only amla but also additional ingredients, such as silicones. This serum differs from other products from Dabur brand, mainly due to its short list of components. At the beginning we see two types of silicones – volatile, easy to wash off with a shampoo, completely harmless to our hair. They create a protective coating on your wisps, that is responsible for preventing water loss. Next, there is amla oil and other important ingredients. Dabul Amla Serum contains amla oil, to be more precise – extract from amla fruit (Indian gooseberry) macerated in jojoba oil. The secon component is jojoba oil. Its main taks is to nourish, strengthen, regenerate and add shine. Amla oil is also enriched with vitamin E that has strong antioxidant effects and protects from harmful UV radiation. Another element of Dabur serum is rosemary oil that is responsible for boosting hair growth and preventing dandruff. Amla oil plays the key role, thanks to which, serum instantly regenerates dry and damaged hair (due tu colour-treating, perm, etc.). Thanks to applying serum regularly, your hair will protected, healthy, strong, shiny. 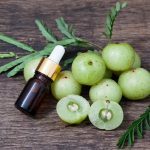 Additionally, amla oil can also boost hair growth, eliminate dandruff and excessive hair loss. Serum provides strands with resilience and perfectly protects hair ends from splitting and damages. apply one or two portions on wet hair after washing, but before blow-drying and styling. apply few drops of serum on dry hair when combing, also during the day.